All our consultants have extensive emergency service and emergency management experience in crisis and emergency management. Mark James is a risk, fire and emergency management specialist. 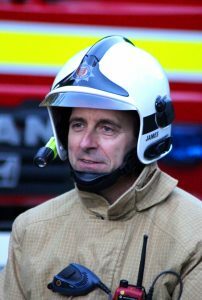 A recently retired Chief Fire Officer and Head of Emergency Planning for the States of Jersey, where for the last 11 years, he has acted as the principal national advisor to the States of Jersey Government on all aspects of fire and emergency management. Mark has also played a role outside of the Channel Islands by providing advice and support to Gibraltar and the Falkland Islands Governments. Mark has also worked closely with the Service Interministériel de Défense et de Protection civiles (SIDPC) in La Manche to formalise emergency management arrangements between the Channel Islands and France. During his early career Mark served for 18 years with Essex County Fire and Rescue Service. During this time he was seconded for two years into the Government’s Fire & Resilience Directorate working on the ‘New Dimension’ civil resilience programme developing the UK Fire & Rescue Services response to terrorist attacks post 9/11. He subsequently rose to the rank of Deputy Director at Essex County Fire & Rescue Service where he chaired the Essex Resilience Forum. During this time he also attended many major incidents including a major blaze at an oil depot at Buncefield, a Korean Boeing 747 aircraft crash at Stansted Airport and a large fire involving Jersey’s Gas Holder. In 2006, Mark was awarded a study emergency management in the United States. During the scholarship he undertook short placements with the Federal Emergency Management Agency (FEMA), the US Emergency Management Institute and Fire Departments in Washington and Los Angeles. As part of the scholarship Mark completed a professional credentialing process by the US Centre for Public Safety Excellence. Mark has a Bachelor of Science degree in Fire Engineering Management from the University of Central Lancashire, a Master of Science degree in Risk, Crisis and Disaster Management from the University of Leicester and a Master of Arts degree in Integrated Emergency Management from the University of Bradford. He is also a member of the Emergency Planning Society and a fellow of the Institute of Civil Protection and Emergency Management and the Institution of Fire Engineers. Mark was proud to be awarded a Fire Brigade Long Service &amp; Good Conduct (LSGC) medal in 2009 and the Queen’s Fire Service Medal (QFSM) in the Queens 2016 New Year’s Honour List for distinguished service.